Dry Needling is the term we use frequently in western health care to explain the application of acupuncture needles for musculoskeletal pain (pain from muscles, joints, and connective tissue). The primary goal of dry needling is desensitizing oversensitive structures in order to restore motion and function. At Peak Physio, we frequently consider the use of Trigger Point Dry Needling as an adjunct to our physiotherapy treatment. It is particularly effective at releasing stubborn, large, or longstanding trigger points that sometimes massage can’t release. It is frequently used in conjunction with soft tissue massage to restore a muscle and joint’s function, frequently in order to optimise a rehabilitation program we have designed for you. Our practitioners are trained to use a sterile technique, and to navigate using our extensive knowledge of anatomy to apply the technique not only effectively, but safely. Although the tools are the same, acupuncture is very different to Trigger Point Dry Needling. 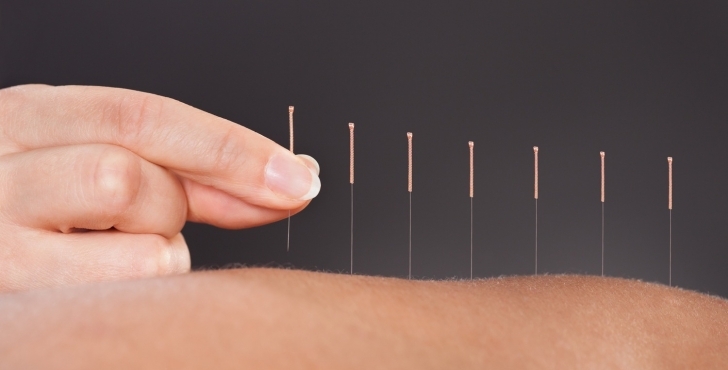 Generically speaking, traditional acupuncture originates from Traditional Chinese Medicine, where needles are applied along meridian lines with the objective of affecting “chi” or energy flow. These lines generally reflect organs, and as such this type of medicine can claim to treat anything from musculoskeletal pain, such as a sore shoulder, to organ dysfunction or even assist with lifestyle problems such as smoking cessation or stress. Although factors vary greatly depending on the treatment, most sessions will involve multiple needles along these meridians left for a period of time. Sometimes the clinician will stimulate or “tweak” the needles. It is more frequently then not a relaxing and pain free experience. What does Dry Needling involve and do I want to try it? Trigger Point Dry Needling is the direct application of acupuncture needles into trigger points (the tight band in a muscle, aka “knot” or “spasm”). It is rarely comfortable, but certainly an effective way to release a stubborn muscle and has an instantaneous effect that should continue to improve over 24-72 hours. Successful application is characterised by a local twitch response (literally a twitch or jump in the muscle belly) and takes about 10 seconds per trigger point or spot. Sometimes only one trigger point needs releasing, and sometimes multiple muscles are addressed. It depends on your presentation, diagnosis, and tolerance to needling as a whole. It is characteristic for a successful treatment to leave you achy as the waste product that has been accumulating in a dysfunctional muscle is released, however the function of the muscle improves instantaneously. The achiness usually passes within a day. It is a similar feeling to a deep bruise, or a muscle that has been overworked at the gym with a new routine. Although uncomfortable most people do tolerate this well, aided with a heat pack and stretching if needed. Interested? Ask your physiotherapist if trigger point dry needling is appropriate in your treatment and book a physiotherapy session today! Previous Pain? What is Pain?